When starting out on The Warlords on Facebook you will need to create and name your avatar. You have two choices, male or female. Male characters currently have less options available to them when it comes to customization, as opposed to all the extras female characters receive. Currently male avatars start off stronger in the earlier levels, but due to the extra options female avatars receive later on, they become the strongest. Things to consider when choosing which avatar you want to use. Male avatars get access to the Pirate's Coat at level 45. The coat allows the chance for the avatar to become invisible, absorbing all damage. This is accessible much earlier than the female equivalent. The female gets a similar option, The Female Cape at level 70. Both get access to a helmet that allows the avatar a small chance to deal three times their normal damage around similar levels. The male version is available at level 37, while the female avatar is granted access at level 35. That is about where the similarities end, and where the female avatar becomes stronger due to the extra options. The Female Robe, available at level 60, gives the avatar a 25 percent chance to return to the staging area when their health goes below 10. The avatar comes back the next turn with full health and all debuffs removed. They also have two options for boots, Long Boots Female, which give a 20 percent chance to delay one opponent's card in queue by one each turn. These boots are available at level 34. Then there are Heavy Boots Female. These are available at level 65 and are similar to the other boots, only these give a 25 percent chance. The last benefit to the female avatar is the ability to dual-wield weapons, while the male avatar is stuck with only one weapon choice and a shield. Females may also use shields as early as male characters. The game is still in beta, so these differences may change. Take all these things into consideration, while the avatar does not usually decide the outcome of a battle, sometimes it can completely turn the tides. While The Warlords on Facebook is a game of strategy, it is also a game of chance. Your cards that come out are chosen at random. When starting out, your first deck is limited to Mace Warriors, Warrior Mages, Aquila Champions, and Heldian Warmaidens. Each one has its strengths and weaknesses. Mace warriors have a speed time of two, this helps them come out into play faster. They deal crushing damage which is a great counter to archers. They deal three damage to normal units, but do double to archers. Archers are used pretty heavily early on. One or two of these in your first deck is ideal. They have a solid health pool for starter cards, but their downside is that they cannot hit air units. 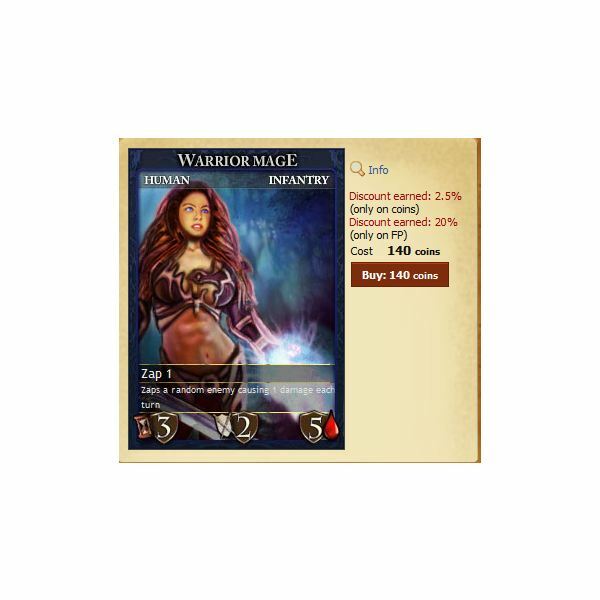 The warrior mage does two damage to the opposing card and one damage to a random enemy unit in play. 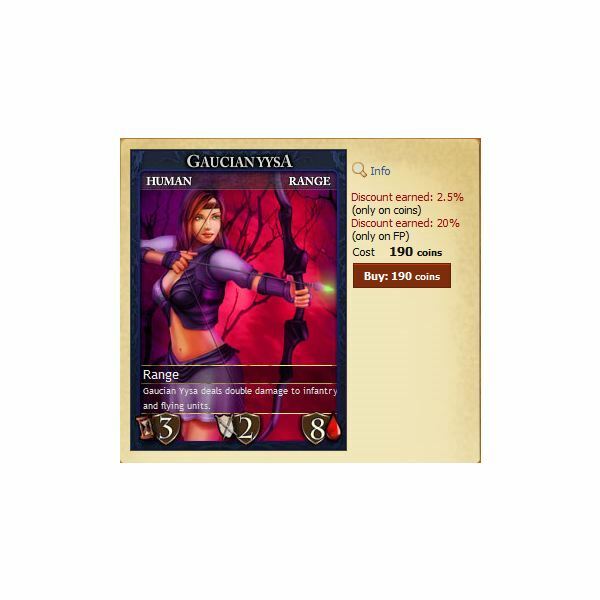 The downsides for this card are it's slower load time of three, five health, which will usually die in one to two hits. Its initial two damage cannot hit air units. There are not many pro's to this particular card, which is why it is rarely used. Avoid this card. 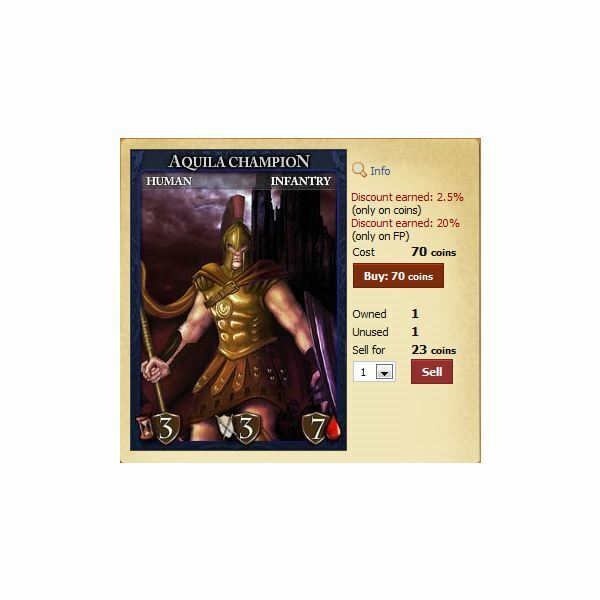 The Aquila Champion is a decent card. It is definitely wise to have one in your first deck. 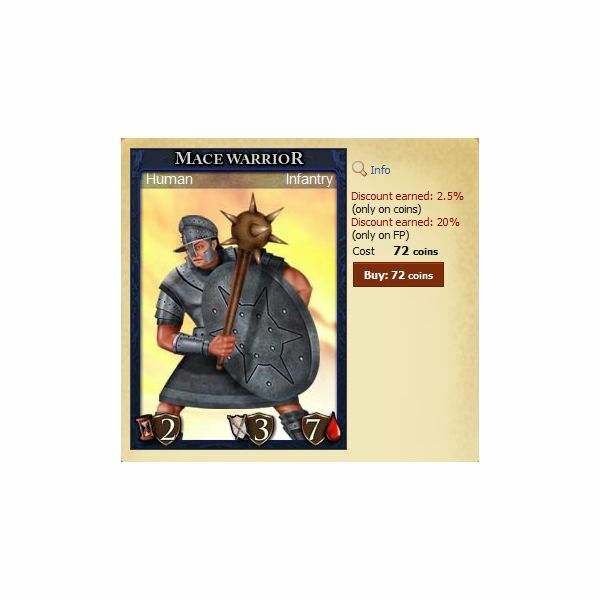 Similar to the Mace Warrior in health and damage, although a little slower in the speed at which it comes into play. The pro's are that it will do double damage to calvary units. The con's are that it cannot hit air units. Although calvary units are not used as often early on, you will need at least one of these cards in your deck to complete some of the strategy quests. 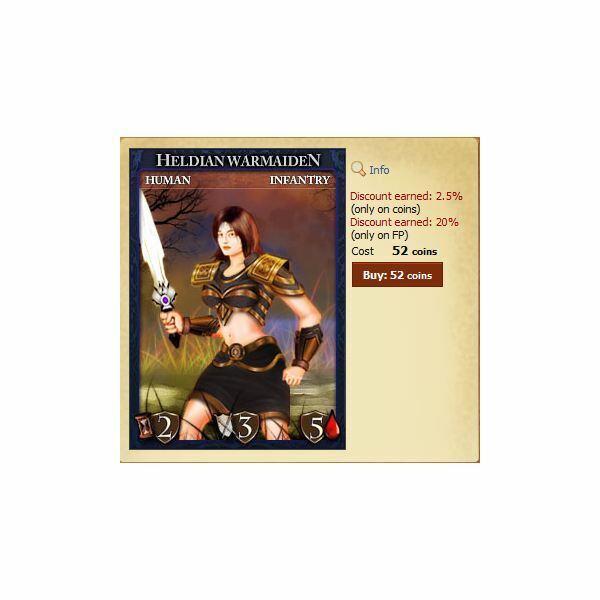 The Heldian Warmaiden is your average card. Not terribly bad, but nothing great about it either. 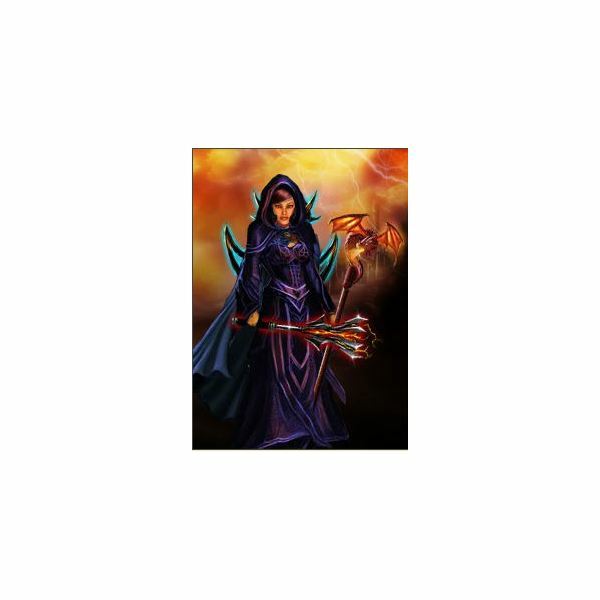 The pro's are that she has a deck speed of two and does three damage to the opposing unit. The con's are that she has low health and cannot hit air units. Now it is time to create your first deck. You must select your avatar as the leader of you first deck. Each deck must contain one hero card and five units to create a squad. Your first choices are very limited. You are given the option of two Mace Warriors, two Heldian Warmaidens, one Warrior Mage, and one Aquila Champion. My suggestion would be selecting two Mace Warriors, two Heldian Warmaidens and one Aquila Champion for your first squad. Before you get started there is an easy way to get your first avatar upgrade, the Flaming Sword. On the homepage of The Warlords on Facebook you will notice a blade across the screen. Below, it will list five steps necessary to unlock the weapon. The steps are simple enough and once you have completed them you will gain access to the fiery sword. 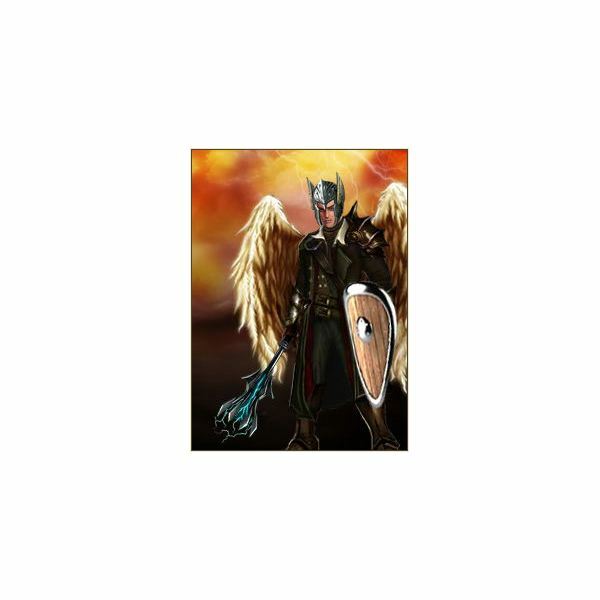 To equip it, click your Profile tab, under your avatar photo you will see Edit Avatar. For males, click Arms, find the weapon and left-click it. For females, select Primary Weapon and left-click to equip the sword. Once that is done, click Save Avatar, and you are now equipped with your first upgrade. Now that your first deck is created you have multiple options. You can pick the Quests tab which contains Treasure Quests, Strategy Quests, The Oracle's Temple and Monster Quests. You also have the choice of choosing the Battle tab. Here you can challenge rivals for coin and experience, challenge friends, take revenge on those that have defeated you or your friends. It also contains the Tournament tab. You will not be able to enter any tournaments this early on in the game. You are given 170 coin and 1000 coin in the bank. You can decide to start buying new cards now. To do so, click the Market tab and then the Buy Cards Tab. Here you will see what is available for you to purchase, and what cards are coming up for purchase in future levels. My advice would be to swap out your two Heldian Warmaidens for two Gaucianyysa, a range unit that deals double damage to infantry and flying units. To swap out the cards click the Squads tab, click on your squad, there should only be one at this point. Click the Edit Squad button, click Next, Pick Units, deselect the two Heldian Warmaidens. Add your two new archers by simply left-clicking on the card. Now that you are ready to start, we will cover what to expect from each tab, and how to maximize your coin and experience gain. How to get allies, which affect your Avatar's health and your overall defense. It's pretty simple to get allies in The Warlords on Facebook. Simply type Warlord in your Facebook search engine. Choose one group or several. Start clicking people's profiles, and add them as friends. 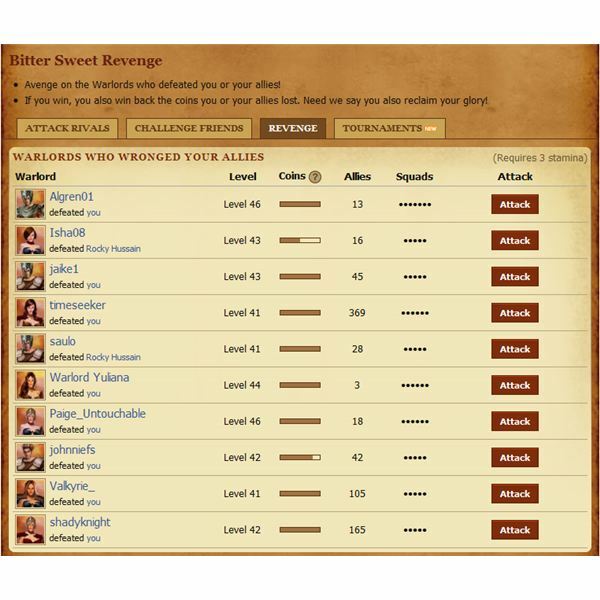 It is helpful to include in your friend's request that you play The Warlords. Once you have had a few people confirm your friend request, go to the Allies tab, then send an ally request. Soon your allies will start to grow, allowing easier progression and a more powerful army. Why do I need allies? Monster Quests – These are designed to be completed by multiple people, and the rewards from them are very desirable. 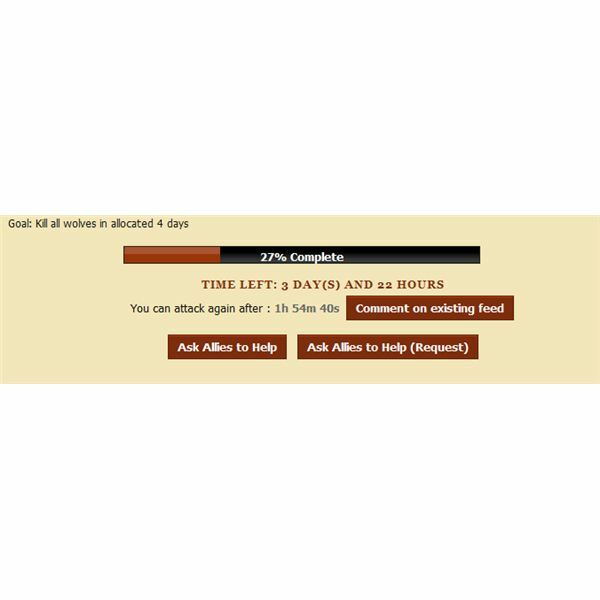 Free coin and experience daily – Everyday you can scroll down to the very bottom of the game, click your ally and click the help ally button. This gives you four experience and 40 coins per ally. The more the better. You also have the option to send them free potions and energy packs. Item trading – short one piece for a card or an item you want? Simply click the request item button and your allies may be able to help you out. Achievements – There is an achievement for getting 10, 50, and 100 allies, which grants you Facebook points. Facebook points allow you to buy exclusive items for your avatar and powerful cards. It would also be in your best interest to join a Warlords Monster Quest group, and an Item trading group. These were created by fellow players to help each other complete Monster Quests, and trade items for equipment and cards. Use the search function on Facebook to find these, again you can simply type Warlords. 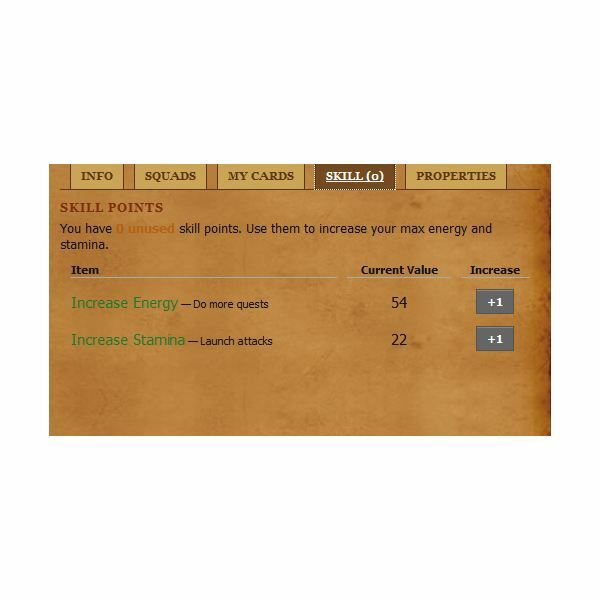 As your avatar levels up, you are given skill points that can be used for two things. One is to boost your energy, which is used to complete any quest you do. The other is stamina, which is required to attack other players. As you start out, you will want to begin to use your skill points to boost your energy. Quests, mainly Monster Quests, should be your priority. Also, one point of energy takes three minutes to recover as opposed to stamina, which only takes one minute. Do not spend all your points completely in energy. I would recommend alternating a three to one ratio, in favor of energy. Under the battle tab you have several options. There is Attack Rivals, as the picture on the left shows. There is also Challenge Friends, Revenge, and Tournaments. When starting out you will want to select the Attack Rivals tab. This will give a list of players, details on how much coin they have. It also shows the number of allies and squads they have. Choosing the right opponent is crucial. Remember, players with more allies will have higher health and defense compared to you, when starting out. Also, there is the coin gauge. Picking targets with a full coin gauge is a good idea, as you have a chance to steal a larger portion of their coin. You get more experience and possible coin for defeating higher level players, although the risk is greater. After defeating several opponents, you may start to notice that you are getting less coin and experience for victories. That is because you are attacking the same opponent within a short time period. The more you attack the same person, the game begins to cut the experience and coin received in half until it becomes worthless to attack. Try to keep track of the names of players you are attacking to maximize experience and coin gains. Slowly, they will give regular experience and coin after a while, as long as you do not attack them for a given period of time. Losing is inevitable, it happens to everyone now and then. The Revenge tab allows you to attack players that have defeated you, giving you the chance to take back coins robbed from you. The question is, do you think you can win? They have already defeated you once. Was it luck, or do they have a better deck? The Revenge tab is a good way to see the flaws in your deck and make corrections. You may have too many of a certain kind of unit that is vastly weaker, slower, or just cannot hit their card. This is the perfect place to begin balancing your deck. You will notice two sections on the top right of your screen, Coins and Bank. After defeating someone in battle, completing a quest, or helping an ally, you will receive coins. The coins displayed in your Coins section is vulnerable to being stolen when defeated in combat. It is a good idea to bank your coin as often as you can. To do so, left-click Bank and then deposit. This safeguards your coins, as players cannot steal from your bank. Banking takes ten percent of whatever is being deposited and you must keep at least 100 coins outside the bank at all times. Tip: If you are confident in your deck, leave a decent amount of coin out to lure players into attacking you. If a player attacks you and loses, you gain experience. People often target players with large amounts of coins to maximize their stockpile to buy more cards. 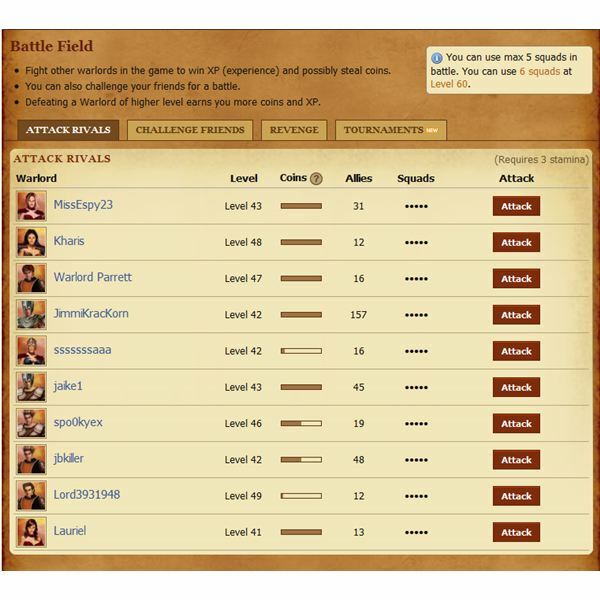 With a solid deck, you can easily gain experience while not even online. Monster Quests play a vital role in The Warlords on Facebook. The rewards received for completing them are higher than any other quest or battle will give. The rewards include coin, Facebook Points, Alchemy items and Blacksmith items. All vital to building a stronger army. The more you complete, the faster and stronger your decks will become. 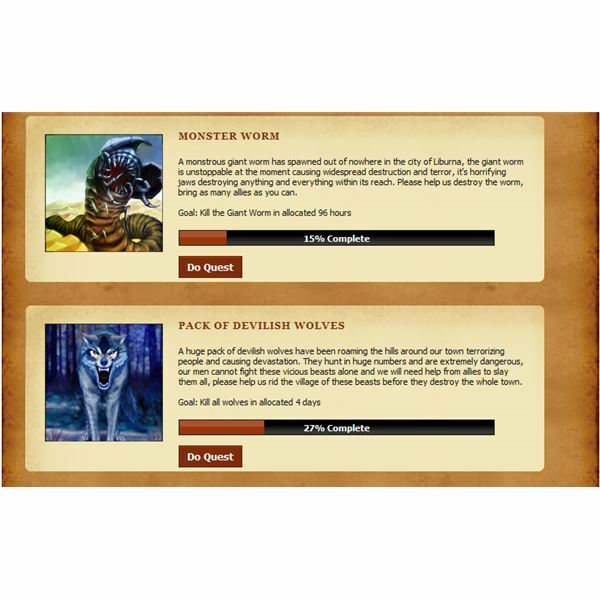 At first only one Monster quest is available, The Pack of Develish Wolves quest. You are given four days to complete the quest. As you level up, new Monster Quests become available. The higher the quest, the better the rewards. When you start your first monster quest, you will notice that you hardly put a dent in its completion. You are given four days to complete the quest and are allowed to attack every three hours. This is where having allies becomes necessary. After you do your first round of the quest you will notice several options available. The first is Ask Allies to Help, this makes a post of your Facebook wall requesting the assistance of your allies. The second approach is more direct, Ask Allies to Help (Request). This sends a direct request to your the allies of your choosing. When choosing this option, you are shown a list of all your allies. Depending on the quest you are doing, you will be allowed only a select number of allies to request help from. For your first Monster Quest, The Pack of Develish Wolves, you are allow to request 12 allies. Joining a Monster Quest group, set up by other players, is a great idea. To find one, simply type Warlord in your Facebook search engine. They may be abbreviated by MQ. After joining a group, posting your quest for others to help with is simple. If you posted your quest to your Wall on Facebook by selecting Ask Allies for Help, simply go to your Wall, find the quest. Now right-click the 'fight now' text and copy it's link location. Go to the Monster Quest group page and paste that on the page. People will want to help, as once your quest is complete, depending on how much they helped, they will be rewarded coin and a chance for one of the items.